Palestinian director Hany Abu-Assad is an Academy Award favorite, with two of his five features (Paradise Now and Omar) getting nods for Best Foreign Film. Now, he’s back with probably the most feel-good film in his career; following the real life of Arab Idol winner Mohammed Assaf, who shot to fame back in 2013 with his incredible journey from Gaza wedding singer to the stages of Idol . 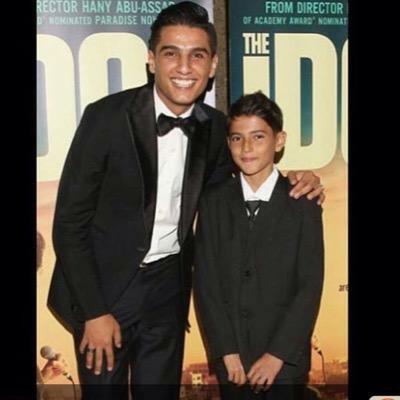 Though the first half of The Idol, dealing with Assaf’s childhood (Q. Atallah) and his relationship with tomboy sister Nour (H. Atallah), seems highly fictionalized considering his stance on supporting his younger sister becoming a singer , it’s what gives grown-up Assaf (Barhom) his higher sense of purpose. It also modernizes the character to make him palatable to outsiders who would gasp in discomfort at a boy telling his sister that she won’t be performing for being a girl, instead of sassying his way out to stand up for her. Through the nagging of Nour and the support of his pals, Mohammed begins his unlikely journey to stardom with his God-gifted voice; and Qais Atallah is up to the challenge not only because look-wise that was pretty good casting, but also because there was a certain vulnerability that made you root for him straight away. Tawfeek Barhom looks less like the famed idol, but has the toughest job as he’s exasperated with his situation and borders on being annoying during his confrontation in his failed Skype audition try. However, the arc explains what Palestinians must go through to simply step out of the controlled areas, turning something as banal as participating in a reality TV show that seeks ratings into an underdog story, an inspirational film of hope and giving voice to those we don’t often listen to. The Idol then settles for a more comfortable narration, following Assaf on his journey to get to Cairo and Lebanon and the chance encounter with Lady Luck, that if it weren’t for the fact that it happened for real, it might look like Deus Ex Machina. The kid was really meant to make it. Yes, of course, he WINS. This is why we’re getting the movie. The biggest hurdle of a movie based on a known story is that people think these should surprise you [This is a criticism I recently heard from the latest Queen of Katwe trailer], when in fact most biopics should inspire or teach us something. He became an Arab Idol when the odds were all against him. Pretty astonishing.